When registering to Convertize you create an account and a specific profile. From there, you can create as many projects as you want and invite an unlimited number of collaborators for each project, whichever plan you are using. This information is displayed on the Dashboard of your account. How is the monthly traffic usage counted? Your monthly traffic usage is counted according to the number of unique visitors on the page you are modifying. When you create a project and you invite collaborators in the project, only visitors to a project you have created will be deducted from your allowance. Visits to a collaborator’s project are not included when calculating your monthly usage. What happens if I reach my traffic limit? 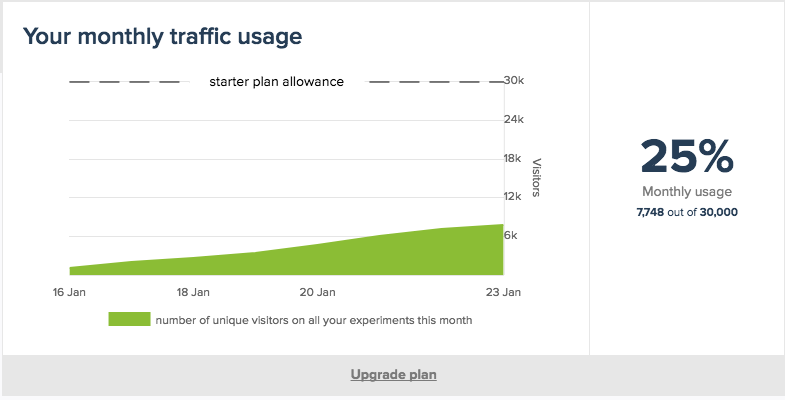 If you reach your monthly traffic allowance, your experiment will be automatically disabled. You will still be able to view the results and modify your experiment, and also to create new experiments. However, you will not be able to launch or relaunch any experiments until the next month’s allowance begins.